Very unique birdhouse has been created using a little Arduino programming and hardware that has been specifically designed to alert authorities of forest fires before they get completely out of control. 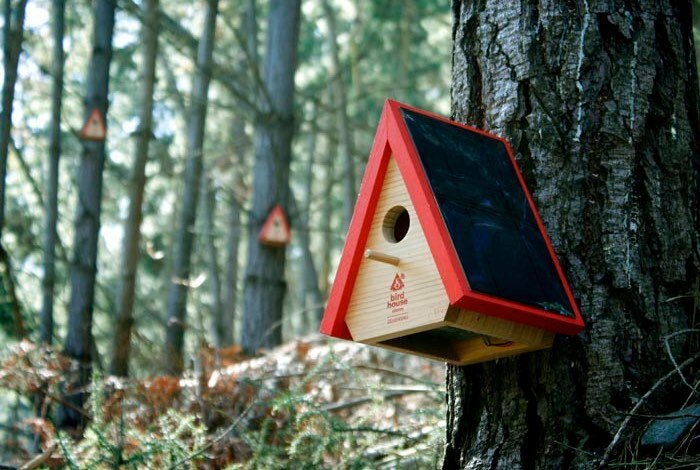 The Arduino bird boxes are fitted with a solar panel, rechargeable battery and a smoke sensor together with a 3G network connection. Allowing the bird box to send a geo-located signal to local authorities if it detects a forest fire nearby. The prototype Arduino bird boxes have been designed by Ogilvy & Mather, are currently being tested in a development stage, before being rolled out further afield. Check out the video below to learn more about the Arduino technology and how they work. The Arduino website explains a little more about the inspiration behind the Arduino bird boxes. The northern part of Spain, which is full of villages, vegetation and wildlife, is prone to wildfires. In fact, nearly 40% of the land was burnt back in 2015. Unfortunately, whenever a fire breaks out in a remote area, it often goes unnoticed or reached before damage occurs. With these instances becoming more common, insurance company Generali decided to find a better solution for early detection. For more information on the new Arduino bird house alarms jump over to the official website for details following the link below. If you enjoyed this article you are sure to enjoy how to build your very own Arduino wind speed meter or anemometer project which is easy to build with basic Arduino skills.